It was the second week of karate, and Boots was starting his new sport the same way he’d started soccer. He’d flop. He’d flit. He’d spin merrily and smile broadly. Then he’d look appropriately chagrined when a sensei took him gently by the shoulders and steered him toward where he was supposed to be. He’d stay there for 3.6 seconds, then the twirls, tumbles and twists would begin again. It made me wonder what he’d do it he were enrolled in dance class. Start practicing his jab punch? Probably not, because it appears that dancing is what Boots does when he’s discombobulated. Some people chew their nails, some twirl their hair. Boots pirouettes. And, just as he couldn’t focus at the start of soccer season, he had trouble concentrating in karate. Too much noise. Too many new people. A soft mat to flop on, so might as well flop. I like that she called it an issue and not a problem. As far as I’m concerned, it’s not a problem at all as long as Boots (eventually) starts paying attention for most of the class. 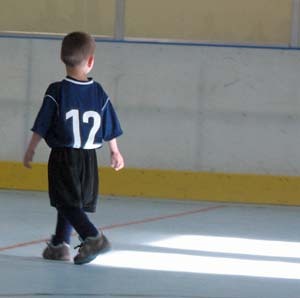 At the start of soccer season, I read his lack of attention as a lack of interest even though he’d begged to play. He was sooooo different from Big Guy, who was uber focused from the second he set foot on afield. But, then, Boots will sit and work puzzles that quickly tax Big Guy’s patience. By the end of soccer, though, Boots was staying upright most of the time. He consistently ran in the direction the ball was headed and even kicked it once in a while. And now, a week after the season’s ended, as he plays in the back yard he smoothly sends the ball toward the net. He’s slowly starting to catch on in karate, too. “When do I get my white belt?” he asked this week. “When you earn it,” I replied. What they “need to do” is not much at all for his age group – they simply have to stand still, arms at their side, for 30 seconds. No soft shoe. No bunny hop. No hoe down. He’s getting there. He even made it a whole 15 minutes Wednesday night without a sensei having to bring twinkle toes back down to Earth.